Some people like their BBQ smothered in sauce. Me I prefer mine dry rubbed w/ my own secret seasoning. Bet you thought I was going to give you my secret recipe : ) LoL .. no you’re going to have to come by and try them for yourself. 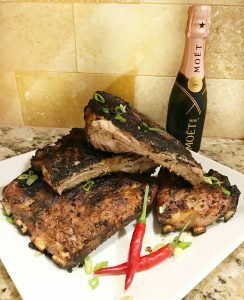 We’ll be cooking these St. Louis Dry Rubbed Ribs in LIMIT SUPPLY this afternoon @ Hunter’s from noon until ______. Next Post:Bad Weather / Hair Day!